It was both a blessing and a curse to have you recommend things to read and watch and listen to this week. The curse is that my pocketbook took a hit from all the intriguing titles appearing in the comments. 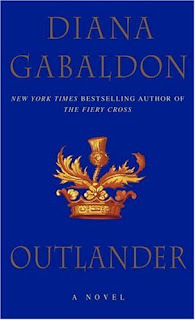 One book mentioned more than once was Outlander by Diana Gabaldon. I tried not to download it from Powell's straight to my laptop, but something came over me. I read it in one sitting in 8 hours and my eyes and bladder were worse for it. But oh my. It was lovely. Time travel, saucy romance, and great Scots. Any television series described as "Juno meets Gilmore Girls" is bound to make the Tivo cut. Life Unexpected is the newest drama on the CW (so there's sure to be cute clothes, evil glares and possibly a vampire). It's the story of a 15-year-old girl in foster care who needs her biological parents to sign off on her emancipation. Instead, they choose to take custody and see if they can swing raising her. The show premieres Monday night at 9/8c. Here is the first 9 minutes in case you need convincing. I've previously recommended singer/songwriter Joy Williams and now she's become 1/2 of the band The Civil Wars. I think I might love them more. Especially since the other 1/2 is Alabama fella John Paul White. This song is "Fallen" which can be found on their album Live at Eddie's Attic. Bonus? You can download that LP for a limited time for free by clicking here. They also have another delightful EP called Poison & Wine. P.S. Winner of the $25 Amazon Gift Card will be announced in two shakes of a ham hock. Or as soon as I return from a quick meeting. There are refreshments, so I must go.